Familial Amyloid Polyneuropathy (FAP) is an inherited disease that causes progressive sensorimotor and autonomic nerve disorder. Peripheral nerve degeneration (polyneuropathy) begins in small fibers, resulting in sensory symptoms of numbness, burning, and tingling — typically in the feet. This progresses to larger nerve fibers, which leads to muscle weakness and motor impairment throughout the body. Gastrointestinal disturbances are a common autonomic manifestation — irritability, malabsorption, and eventual wasting. Death may occur within a decade of symptom onset. Unexplained carpal tunnel syndrome is often an early feature, due to the involvement of nerves in the wrists. The disorder also involves the heart. 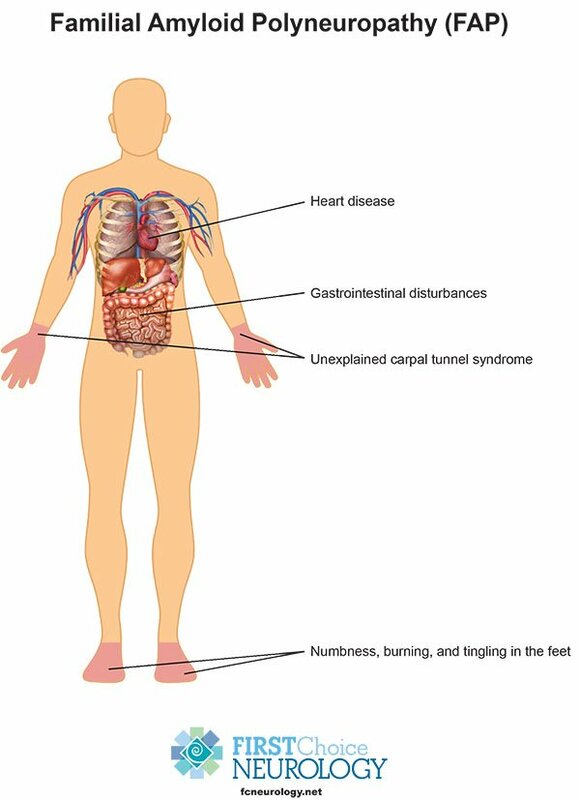 Because of the associated gastrointestinal, wrist, and cardiac involvement patients may visit numerous specialists, yet the underlying diagnosis is often missed. Familial Amyloid Polyneuropathy is caused by an inherited defect in the liver’s synthesis of transthyretin (TTR), a protein which normally transports thyroxin hormone and Vitamin A in the bloodstream. There is a genetic glitch in the formation of transthyretin, which misshapes the protein. This creates a toxic residue on peripheral nerves, as well as, the heart and liver. Many patients eventually undergo a heart and liver transplant. A new medication was approved in late 2018 specifically targeting the creation of toxic transthyretin. The neurologic evaluation of FAP includes obtaining a family history, a physical exam to identify carpal tunnel syndrome or other clinical signs of neuropathy, a nerve test, and a confirmatory genetic screening using a small sample of saliva. This is all easily conducted in the doctor’s office. If your work-up is positive, treatment begins with the new medication, which is given via injection. This results in a dramatic decrease in circulating transthyretin, reduction of neuropathic symptoms, and improvement of the quality of life. A potentially life-threatening neurologic disease is now easily diagnosed and effectively treated. Family members can be genetically screened and addressed early-on. 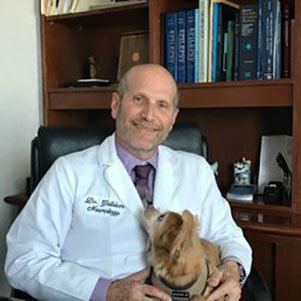 Neurologist, Dr. Jeffrey Gelblum, has been in practice for over 25 years and possesses a keen interest in the diagnosis and treatment of Familial Amyloid Polyneuropathy. His offices are located at the Aventura Medical Tower in Aventura, and Mount Sinai Medical Center in Miami Beach, Florida. To make an appointment with Dr. Gelblum, call (305) 936-9393. He looks forward to providing you a pathway of care for this severe illness. Dr. Jeffrey Gelblum is a Neurologist at First Choice Neurology. He has successfully treated thousands of patients over a quarter century, from South Florida and around the world. He is considered a global thought leader in the neurologic treatment of dementia, seizure disorders, Parkinson’s disease, trauma, and chronic pain, and has hosted educational symposia in the U.S. and overseas. He maintains numerous research FDA-sponsored affiliations, providing patients immediate access to promising new treatment protocols. His practice maintains academic affiliation with the medical residency programs of Nova Southeast and Florida International University. He trains future neurologists, so it is not unusual to encounter student doctors in the office. Dr. Gelblum serves as an expert consultant to the State of Florida and Federal Court system on matters of neurologic injury and disability. He is active in multiple community outreach programs to educate the public regarding care and treatment of neurologic disorders. He has pioneered the use of TeleHealth and other e-medicine technology to provide patients instant medical access. Complementary modalities and alternative care are part of his holistic approach to successful neurologic care.